Localisation has been a well-entrenched business strategy of global companies, from product development and service design to marketing and brand building. Now, we're seeing that strategy being extended to even the look and feel of the offices of multinational companies. Until recently, there was an expectation that each facility of a company, irrespective of where it is located, would be a strong reflection of the company's global brand and follow its universal office design guidelines. Though global branding and design guidelines continue to be important, companies now display a keen inclination to infuse some local flavours into the office environment. Such office spaces are in line with the 'glocal' (global+local) identity that these enterprises want to imbibe. The greatest benefit of localisation of office interiors is that it humanises the corporate brand - it tells you that this is a brand that respects local sensibilities and beliefs. Design elements inspired by local culture and traditions make the community a part of the design story and thus provide an engaging experience for employees and customers. The strong connect that a global company displays for the local culture also acts as an emotional draw for local talent that it seeks to hire. When we use local products instead of materials exported from elsewhere, we support local industries and traditional arts. Locally sourced ceiling products, tiles, furnishing with traditional motifs are a great way to not just give a distinct personality to space but also show that you care about local arts. Localisation is also about selecting the right materials to suit the weather and usage patterns of people here. For instance, wood works well as a floor skirting material in the US but it will not survive in the hot and humid tropical climate, where we tend to mop floors. Similarly, the choice of materials for a cubicle partition will be different in India than in the US. The size of cubicles in India tend to be much smaller, hence people tend to touch the partition as they pass by. So, the material must be durable and of a darker shade. An effective localisation strategy is one that considers both the big design ideas and the smaller details. And that is possible only if the design firm understands both global and local considerations and knows where to create intersections between the two. It calls for a design-and-build approach where a design firm with global exposure and local presence can plan and execute the project end-to-end. The design-and-build approach has taken off well among multi-nationals in India since it gives them access to talent that is well versed in local business and cultural aspects. When a social media company moved to a larger facility in Bangalore, it wanted the new office to send out the message that was a company true to Bangalore. Among the various objectives behind the move to the 240,000 square feet facility was to create a "living-breathing community space" within its walls. The company took the new workspace design as an opportunity to showcase its cultural connection with the city, besides its global corporate ethos and values. To an outsider, Bangalore is a cosmopolitan city with tall gleaming IT parks, malls, pubs and restaurants. But this city on the move has also retained some of its colonial heritage, with British era buildings in Bangalore Cantonment nestling close to the metro rail, a symbol of modern Bangalore. At the company's office, full-scale artworks on this theme overlook the large cafeteria. Local artists hand-painted two 30-foot-tall walls that connect the central area to the cafeteria with images that characterise road-side India. Fun installations of cricket bats and the iconic yellow Indian telephone booth reinforce this theme across the office. Global standards with local essence were the brief for another project, a San Francisco based new-age, digital company. In this case, since the company's core identity is about feeling at home anywhere, there was a strong motivation to bring in local elements into the design template. 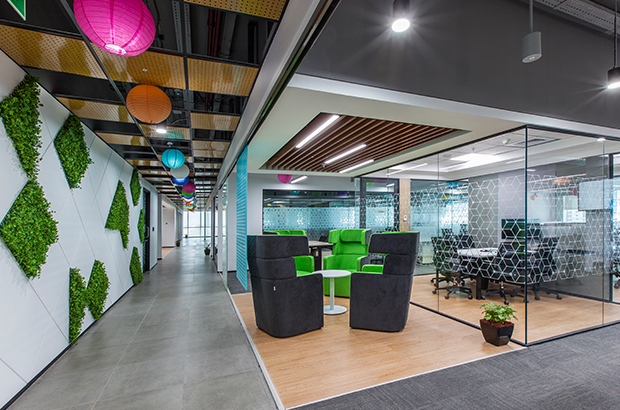 Their new Gurgaon office follows an open floor plan, interspersed with social spaces where employees can discuss work or meet for a coffee break. This informal setting became the ideal space to insert an Indian flavour to an otherwise contemporary office. The company's employees today have a vibrant, colourful Indian street like social zone where they can network with colleagues. Loose furniture such as a brightly upholstered bench and chairs and tables under a canopy lend this space a lively feel. As global companies continue to expand their operations in India, they will need to reconsider the way they have traditionally looked at office design. Instead of a global template, they need to apply contextual design with a high degree of local flavours to create empathy and enthusiasm among the users of the space.